The challenge faced by contemporary art critics is that they have to write from the same disadvantaged point of view as the artist whose work they attempt to discuss: contemporary critics live alongside contemporary artists they focus their attention on. I don’t necessarily view this fact as a major impediment to gaining deeper insight, though. The critics’ words will simply have to be seen against the larger cultural and societal background as much as the artists’. Hindsight can only be had years into the future, and who says that hindsight makes for good criticism anyway. Criticism, in other words, is thus flawed by construction – much like art. Criticism is produced by human beings — much like art. I don’t believe that this makes criticism art, but for sure there’s a kinship. Critics ought to love artists (if not, obviously, their work without having their skills applied to it), and artists ought to love critics. They’re all in the same boat. The fact that of late the ride has mostly been mostly propped up by the grotesquely rich and morally bankrupt ought to bind everyone together even more (including large parts of the audience). For a variety of reasons, criticism has lost its standing in the larger world of art. In the not-to-distant past, mainstream magazines and newspapers used to have and support criticism a lot more. Arts and culture sections, though, are usually the first ones to get cut, leaving many magazines and newspapers now as spaces where there simply are no arts and culture any longer. In parallel, the rise and evolution of the internet has also massively contributed to criticism losing its previous status. If everybody is a critic now, leaving their one to five stars as a reflection of some commercial transaction, it’s easy to think that art criticism is the same thing, namely an expression of some minor or major grievance. It should be obvious that it is not. But it’s hard to imagine the task of squeezing this particular glob of toothpaste back into its tube. 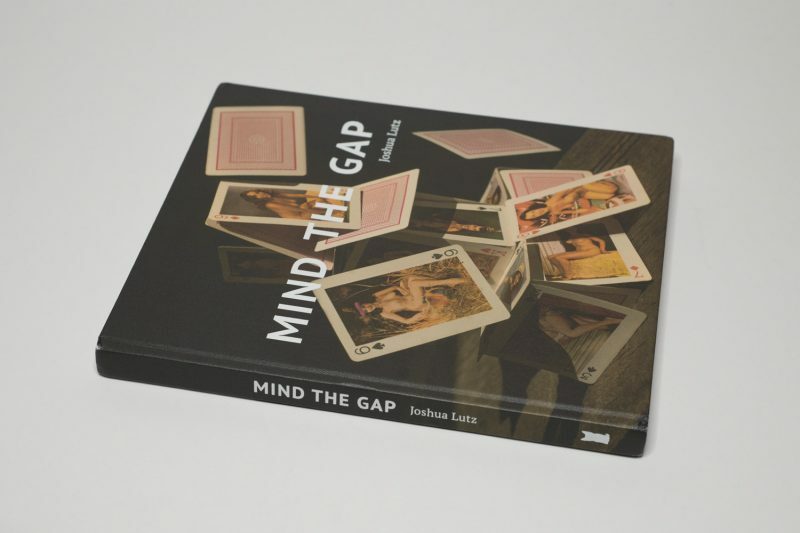 I cannot view Joshua Lutz‘s Mind the Gap without having all that in mind. In fact, when writing critical pieces large parts of my work revolve not necessarily around the item at hand. Instead, I am trying to figure out my particular relation to it: what am I bringing to this book (or whatever else I’m looking at)? How or to what extent is my reaction shaped by that? This is the analysis part. Only when I have this resolved (or when I think I have) I can then move on to trying to bring everything back together to, hopefully, arrive at something that results in some deeper insight. This is the synthesis part. I am not sure proper criticism can do without these two elements, but your mileage might vary. Vast parts of contemporary photography are of their time, dealing with their time in one way or another. That said, with its laser focus on the state of mind of the United States, Mind the Gap might be the most overt book to do so in a while. As has become overabundantly clear over the past decade, but especially since a B-list reality TV star has become the latest occupant of the White House, that state of mind is not in a very good spot. Its many internal contradictions, the fragility of its underlying foundational myth (“the American dream”), and an embrace of a mercantilism and outright corruption that will not even stop at destroying the democratic fabric have resulted in a huge spasm, with one of the two major parties (Republicans) embracing illiberalism while essentially living in an utterly perverted Neighborhood of Make-Believe. In some way or another, all these various issues are addressed in the book through a combination of images and text. Much like in Lutz’s previous book, Hesitating Beauty, there is ample text to be read. But here, the role of the text is expanded, with it playing more than merely a supporting role. If you wanted to, you could consider the text blocks as vignettes in more or less the fashion fashion as the photographs. I think some of the text is a little bit clunky. But in this particular context, in this particular book, that very clunkiness does work — especially given that in many of the pictures the artist doesn’t shy away from visually depicting the garishness of his subject matter, the United States. This critic is just as caught up in this maelstrom — the imploding superpower — as the artist. In fact, I doubt any critic alive would be able to approach the book in a fully disinterested fashion. And what would be the point of such an approach anyway? What would there be to synthesize? So of course, I’m seeing the symbolism displayed throughout the book, even though my read might be different than that of someone who was born and raised here. And someone born and raised here might be any person, with even the three standard categories (“Democrats”, “Republicans”, “Independents”) failing to properly cover the variety of people living in the country. Whatever you want to say about the lack of subtleties in the book, the subject matter does ask for it. Or rather, there needed to be a photographer who would go there and who would relentlessly attempt to unmask a vast variety of his home country’s aspects as exercises in utter phoniness. The point here is not so much whether any or all of these aspects are indeed phony. They might or they might not be. But if there is one thing that unites all these various constituencies in the United States, it’s their undiminished belief in their own being unique, in their own being able to judge properly. There’s no room for doubt, and it’s that very fact, that absence of doubt, that has contributed to the current crisis. So if anything Mind the Gap is an attempt to introduce doubt: to take the book with its collapsing house of cards on the cover at face value would hardly be fruitful. The question ought to be “now what?” Whether it will be able to do that, whether in this particular day and age any piece of art is able to make people question their beliefs I’m not sure. It’s a photobook anyway, a niche product in a niche market that is unlikely to be seen by a large number of people. But then, as that gesture, that futile attempt to have people consider what’s going on, it does succeed.